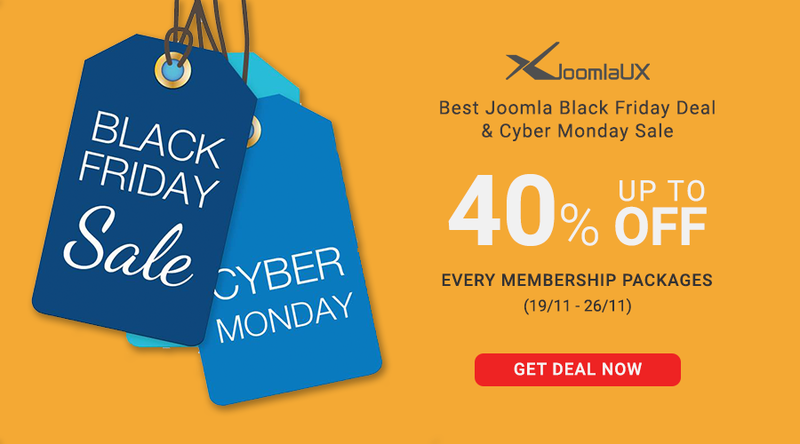 Black Friday and Cyber Monday are always looking days of any shopaholic when they can get an extremely big discount as well as special promotions, and there is no exception for JoomlaUX. We would love to send you the best discount ever - up to 40% on every MEMBERSHIP packages on this special sale season as a gift to positively start your business. Specifically, you will get 40% Off on the lifetime Package, 30% on Premium and Developer Package, and 20% on the standard package. • 20% Off on Basic, Standard Package. The special offer will end on November 26, 2018 (GMT +7), so please save your date to not missing this opportunity. Why should you purchase Membership Packages? Using the membership package, you can get lots of benefits such as accessing all our extensions and get the long-term support, download, and updates. For any problems you get, you can freely submit a ticket at our forum and we will take care and feedback you within 24 hour working day. Currently, JoomlaUX offers three main types of membership packages including Basic, Standard, and Premium tickets with distinguished options. Hence, you should visit and choose the most suitable package with your aim. After applying the Black Friday discount, the price of Basic, Standard and Premium only at €29, €39, and €49 respectively comparing with the regular price (€39, €49, €69). That means you will save your money most if using the premium package (- €20). What are you waiting for? Let's explore our awesome Joomla Extensions and make your right decision!